The best live entertainment and pool lounge in 2706 Pavillion Parkway, Tracy, California is waiting for you now. The Grant Bar & Lounge hosts a different event or celebration every night of the week, with a VIP section for bottle service available on club nights. Our upscale lounge features three televisions, pool tables, and more than 5,000 square feet in which to let loose. Formal attire is required on Friday and Saturday nights. 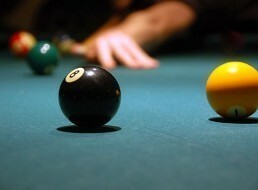 or visit us and play a game of billiards in our pool lounge.